A new sign language created over the last 30 years by deaf children in Nicaragua has given experts a unique insight into how languages evolve. The language follows many basic rules common to all tongues, even though the children were not taught them. It indicates some language traits are not passed on by culture, but instead arise due to the innate way human beings process language, experts claim. The US-led research is detailed in the latest issue of Science magazine. The development of language has long been the focus of debate. Some people in the extreme "nature" camp believe that grammar is essentially hard-wired in the brain, while those in the extreme "nurture" camp think language has no innate basis and is just culturally transmitted. It has been difficult to clear up the argument, because most existing languages are ancient in origin and it is therefore hard to pinpoint how they formed. 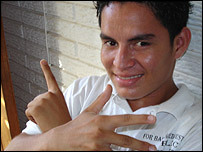 That is why the sign language invented by a small group of deaf children in Nicaragua is so unusual. It has given scientists the clearest insight yet into how humans learn language. "When people study historical linguistics to try to figure out how languages are born they are usually looking at old historical data, like scratches on rocks," explained co-author Ann Senghas of Columbia University, New York. "This is the first time we have had the opportunity to observe it in action because the originators are still alive." Steven Pinker, a psychologist at Harvard University and author of a seminal book on the acquisition and evolution of language - The Language Instinct - is impressed by the findings. "I think this research has made some of the most interesting discoveries in language acquisition in decades," he told BBC News Online. "It shows that children have sophisticated mechanisms of language analysis which give language many of its distinctive qualities." Before the 1970s, most deaf people in Nicaragua stayed at home and had little contact with one another, according to Dr Senghas. Then, in 1981, a vocational school opened, and the children began to communicate with each other. No one actually taught them to sign, but they began to develop a system of gestures to get their messages across. At first, these were rather crude and pantomime-like, similar to the gestures a hearing person might make if they had to describe something without speaking. But as a new wave of children learned the gestures they turned them into a sophisticated sign language, Nicaraguan Sign Language (NSL), complete with traits seen in nearly all other languages - both spoken and sign. One key trait that the children adopted is called "discreteness". This refers to the process of breaking down information into small manageable packages. Expressions of motion are particularly useful for studying discreteness in spoken and sign languages. In developed languages, we break up the idea of continuous motion into separate words. So, in the expression "rolling down the hill", one word (rolling) conveys the movement, while another (down) conveys the direction. But if a hearing person were asked to convey this idea in gestures alone, they would almost certainly do it with a single continuous movement. Dr Senghas and her colleagues showed the deaf people from each of the age groups a cartoon, in which a cat swallows a ball and then wobbles down a steep road. Then they asked the participants to tell the story. The oldest group, who invented the initial "crude" form of NSL, told it with one continuous gesture as a hearing person might. But the younger groups did something different. They separated the movement and direction into separate signs as is done in spoken language. "If they were just clever at learning they would have learned to do it the way they had seen it being done," said Dr Senghas. "But that isn't what they did - they ended up acquiring something different. They ended up breaking down the gestures into something they could build a language out of." This is compelling evidence that humans are predisposed to develop language in this way, say the researchers. In other words, children instinctively break information down into small chunks so they can have the flexibility to string them back together, to form sentences with a range of meanings. Interestingly, adults lose this talent, which also suggests there is an innate element to the language learning process. "We lose the ability to break information into discrete elements as we age," said Dr Senghas. "It is not just that children can do it, but adults can't do it." Dr Senghas does not claim her findings support the extreme "nature" camp, but that they do suggest there is an instinctive component to the way we learn language. "It doesn't prove that language is hard wired to the degree some people say it is, but it does prove the fundamentals of language are part of the innate endowment," she said. "So you don't have language or grammar in your head when you are born, but you do have certain learning abilities." Professor Pinker said the results of the study showed something that had always been suspected by some psychologists. But, he said: "Since children's language ordinarily ends up the same as their parents' language, one couldn't easily pinpoint what their minds added. "It takes a case in which the language children end up with is more complex than the language they hear to identify the creative contribution of the child."